The final Play that Paid Off for Week 3 looks at one of the most common running plays used in the NFL - the Power O - and shows exactly why it is so popular: when executed properly, it can lead to huge plays on the ground. Remember, we are always wanting more nominations to be broken down, so when you're watching the football tomorrow and on Monday night, any time you see a play that particularly impresses you, please nominate away! You can nominate either by tweeting a description of the play with the hashtag #TPL5plays or by nominating in our Facebook group. If we break down a play you nominated, you'll get a mention in the blog and everything! NB: as always, diagrams not to scale. After the huddle: The Jaguars line up in a variant of the I-form, I-right strong, where the 'right' refers to the tight end lining up on the right of the line of scrimmage, and the 'strong' referring to the fullback lining up offset to the strongside (i.e. towards the tight end). The receivers line up initially in 'twins left', which simply means they both line up on the left, Elliot on the LOS as the split end and Justin Blackmon in the slot. There is a relatively wide split between RG Nwaneri and RT Whipmer (for once, it's not my bad drawing behind the gap between linemen!) The Colts line up in their base 3-4 defense, with Zbikowski lined up across from, but deep off, Blackmon, and Hughes shading his inside shoulder (though pretty deep off), but always looks towards the QB, not Blackmon. Davis lines up not across from, but outside Elliot, while on the other side, with no receiver to cover, Powers lines up in the box. Pre-snap: Davis begins to drop slightly back when Blackmon motions across the formation, taking the Jaguars out of twins. Davis returns back to his original spot, while Zbikowski drops back deep, moving slightly further infield. Hughes creeps down and towards the LOS, while Powers shifts out of the box towards the sideline, always making sure to remain outside Blackmon. Blackmon then starts shifting back towards OL, with Powers following him (but remaining outside). The various motions & adjustments are represented on Fig 1 by the dotted lines. 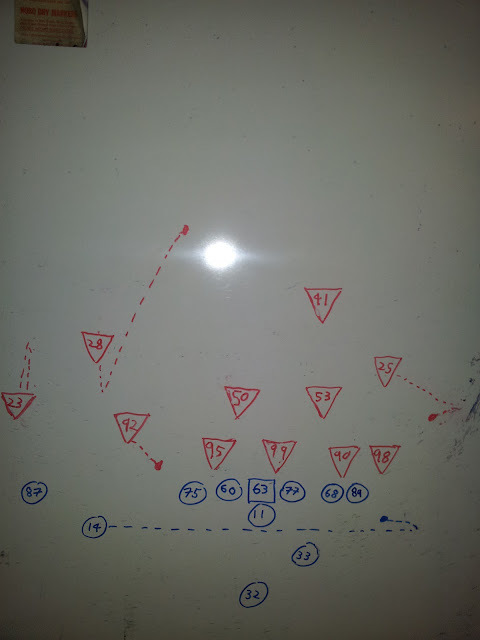 The play: The play is one of of the more commonly used running plays around the league, often called a "Power O". There are a few key features to the Power O: a majority of the offensive line downblock, leaving the end man on the line of scrimmage unblocked. The play in many respects is similar to a traditional counter trey (a variation of which we have previously discussed), though the ball carrier does not take a dummy step in the opposite direction. Another major difference is that, rather than using two backside pulling linemen as lead blockers, the Power O uses a frontside blocker (typically either the fullback, as on this play, or an H-back), and one pulling lineman as the two lead blocker. On this play, the end man on the line of scrimmage is the SLB, Robert Mathis. Mathis is left unblocked on the line, and comes into the backfield, where he is met head-on by the fullback, Jones. Jones does a great job of locking up Mathis, sealing him to the outside - point 'A' in Fig 2. Most of the offensive line, plus the tight end, downblock the rest of the defenders on the LOS. The most difficult block along the line is the one that the center, Meester, has to make, reaching across the large hole vacated by the pulling backside guard, Brewster. While he does get some help from the left tackle, Monroe, truth is that he never really needs it, moving swiftly to get to the DE, allowing Monroe to immediately peel back to block the WLB, Hughes. One of the most successful blocks on the play, however, is the doubleteam by RT Whimper and TE Lewis on the LDE, marked by 'B' in Fig 2. The two blockers not just block the end, but motor him backwards, actually driving him into Freeman, preventing him from being able to get to the ball-carrier. With the DE pushed far infield, it leaves a large hole inside of Jones. The pulling lineman, Brewster, runs up through the hole inside of the fullback and puts a block on the first defender inside the hole, Conner, blocking him to the outside ('C' in Fig 2). Jones-Drew receives the handoff from Gabbert ('D'), then follows Brewster through the hole, reading his block. Typically, the rules for running backs in reading their blocks are pretty simple: if your lead blocker blocks someone to the outside, you cut inside of him; if he seals someone to the inside, then you bounce outside of him. With Brewster blocking Conner to the outside, MJD cuts inside of him, turning downfield and towards the endzone. There is one more crucial block on the play, and that is made by rookie wideout Justin Blackmon. Antoine Bethea comes down to tackle Jones-Drew, but Blackmon, slanting infield, runs up and blocks him inside. Jones-Drew reads the block, running outside of him, and is left with nothing but open field ahead of him as he sprints to the endzone for a 59-yard touchdown. Just two more points, looking at why defensive players were out of position to stop Jones-Drew. Firstly, Jerraud Powers, whose actions are detailed at point 'F'. He sees the fullback, Jones, running to the outside of the line, and may reasonably have then expected that the play was an off-tackle or sweep. It is very clear that he corners are charged with outside contain on the play - being responsible for ensuring that a run play (or QB scramble) does not get outside of them, instead forcing running backs downfield (where, ideally, there are defenders ready to tackle him) rather than letting them move outside until they are past all the defenders, where they may then be able to turn downfield without any defenders over the top to bring them down. So, seeing the fullback, it is fair to assume that Powers was coming down to keep contain, forcing MJD to turn downfield; instead, being a Power-O, MJD runs up inside of Jones, leaving Powers completely out of position to be able to make a play on him. It should be noted, however, that Powers' actions were actually entirely sound and correct from a scheme responsibility perspective. Lastly, though pretty minor, there is a small contribution by the 'X' receiver, Elliot. He appears to be attempting to mirror Blackmon - i.e. 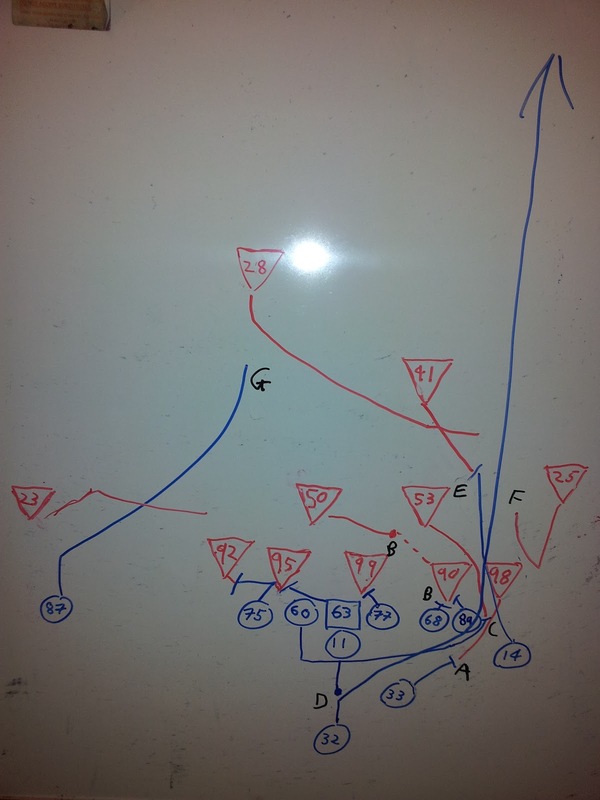 running a slant before turning downfield and looking to block a safety - and though he doesn't get to Zbikowski, his route does draw Zbikowski towards him briefly before the safety looks into the backfield and sees the handoff ('G' in Fig 2). Still, by that alone, Zbikowski is no longer in premium position to get to Jones-Drew, taking too shallow an angle so that by the time he gets parallel to Jones-Drew, the running back is past him. Had Zbikowski not originally rushed forward towards Elliott, he would have been deeper when spying the handoff, and would have been in better position to get over the top of the play; while he would not have been able to prevent the play for going for a massive gain, he might have at least saved the touchdown. However, by moving forward to cover Elliot, he takes himself out of effective position to help on the play, and is left to watch hopelessly as the Jaguars score their first touchdown of the game, one which would eventually lead to a come-from-behind victory. Hope this break down gets you excited for the last football games of September, and remember, we want you to nominate as many plays as you'd like to be one of our Five Plays that Paid Off for Week 4. Enjoy the games!